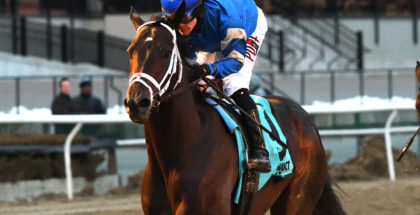 Outwork Heads To Derby After Wood Memorial Win: Outwork, Repole Stable’s homebred son of Uncle Mo, cemented his place in the Kentucky Derby and convincingly negated the memory of his sire’s heartbreaking loss as the 1-9 favorite in the 2011 Wood Memorial for owner, trainer and jockey with a hard-fought head victory the 92nd edition of the Grade 1, $1 million Wood Memorial on Saturday at Aqueduct Racetrack. Sent off at 2-1, Outwork settled in the three-path down the backside under Hall of Famer John Velazquez, tracking the pacesetting Matt King Coal through an opening quarter-mile in 22.91 and the half in 46.93. 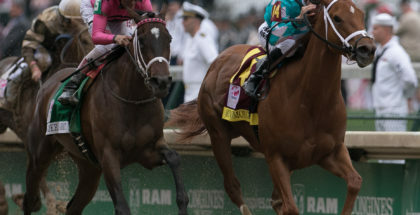 Todd Pletcher’s sophomore pupil took control with a sixteenth of a mile left as Matt King Coal began to drop back along the rail. Early trailer Trojan Nation, a maiden trained by Paddy Gallagher, cut the corner turning for home and broke through on the inside and the pair traded bobs to the wire. Outwork completed the 1 1/8 miles in 1:52.92 over a muddy and sealed track to return $6.80 as the second wagering choice. The Wood Memorial, part of the last round of official Road to the Kentucky Derby prep races, is worth 100 qualifying points to the winner, bringing Outwork’s total to 120. Trojan Nation, who has finished third three times in five starts, picks up 40 points to a spot in the “Run for the Roses” at Churchill Downs. Another 2 ¼ lengths back, Treadway Racing’s Adventist finished third with a late rally on the outside, bringing the Leah Gyarmati trainee’s qualifying points to 32, a head in front of Matt King Coal in fourth. 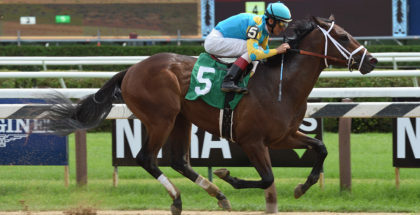 Grade 3 Gotham winner and post-time favorite Shagaf, already armed with 50 points towards a Derby berth, broke slowly and failed to menace to check in fifth, followed by Tale of S’avall, Flexibility and Dalmore to complete the order of finish. 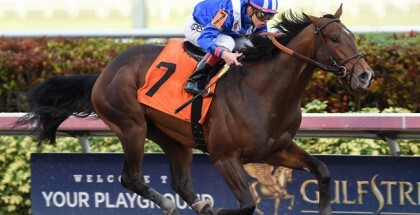 A runner-up in his stakes debut behind his stablemate Destin in the Grade 2 Tampa Bay Derby, Outwork improves his career record to three wins and a second from four starts with earnings of $701,100.